31 October 2016. The earthquakes of October destroyed the Basilica of Saint Benedict in Norcia and have restricted access to the northernmost stretches of the Cammino di San Benedetto. Much of the Cammino remains open, and just as beautiful and welcoming as ever! Tom and I love Italy, and have traveled extensively there. 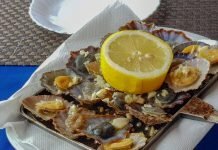 However, until recently, when we were invited to walk the Cammino di San Benedetto (Way of Saint Benedict), one of the newly launched Italian Wonder Ways, we had not spent time in the Lazio Region. We quickly learned that Lazio is, indeed so much “more than Rome”. We enjoyed stunning sunsets all along the Cammino and arrived at our final stop at Montecassino Abbey, just in time for another heavenly display. For five days, we walked country trails and meandered through nature and small villages. Along the way we received a grand dose of Italian hospitality, stunning natural beauty and great local food. And we had lessons in history, archeology and religion to boot! 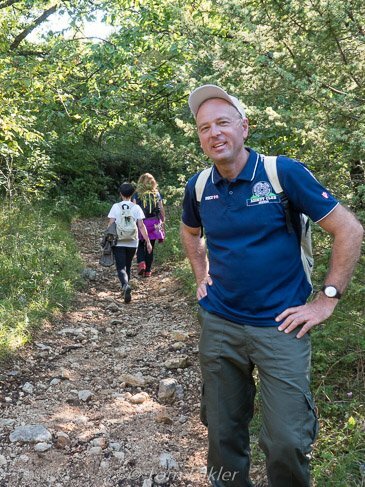 Our guide for the walk was Simone Frignani, who developed the Cammino di San Benedetto and is its greatest evangelist. Benedict of Norcia (he was born there, in 480), patron saint of Europe, came from a family of Roman origin. At the time, barbarians were literally at the gates of Europe, and Christianity was under threat. The monasteries Benedict founded played a major role in preserving and transmitting culture across the continent. After a time in Rome, Benedict moved to Subiaco, in present-day Lazio, where he lived as a hermit for several years and founded monasteries in the area (the first one, in the ruins of Nero’s villa, beside the Aniene River). After thirty years in Subiaco, he moved to the Cassino area, where he spent the remaining years of his life. 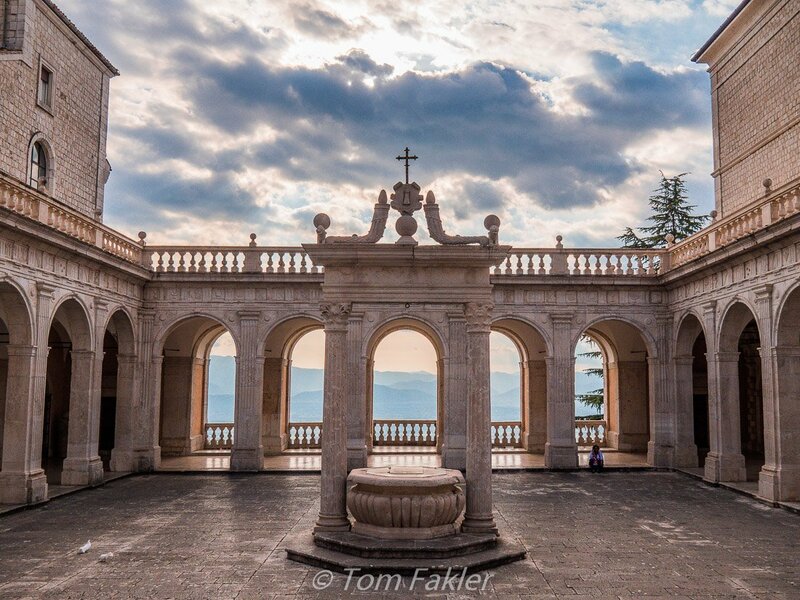 The Rule of St. Benedict — with its precept of ora et labora (‘pray and work’)–was written at Montecassino Abbey. This text was the essential management tool of its day, a rule-book for monastic life still followed by religious communities around the world. Most of Italy’s pilgrimage paths follow routes from various points in Europe to Rome. The Cammino di San Benedetto does not. 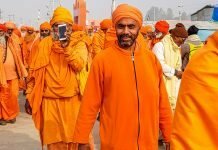 Strictly speaking, this route is not one of historical religious pilgrimage, tracing a path trodden by centuries of devotion. Rather, it follows a trail that connects the dots of the most important places in the life of Saint Benedict. 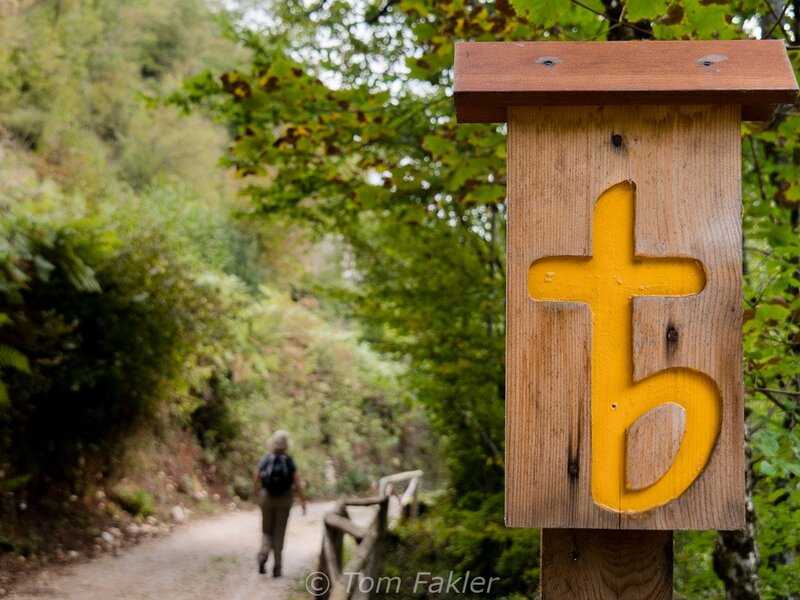 The path begins at the saint’s birthplace in Norcia, Umbria, and leads south into Lazio. There, the path highlights Benedict’s years as a hermit and founder of monasteries in Subiaco. It terminates in Montecassino, where the saint spent his last years and is buried. The Cammino runs for 310 kilometers, divided into stages of approximately 20 kilometers each. The route celebrates nature and local traditions, leaving the winding mountain roads to follow small rivers and reclaimed paths between villages. We were not able to begin our walk in Norcia, due to the recent earthquake that affected mountain villages nearby. 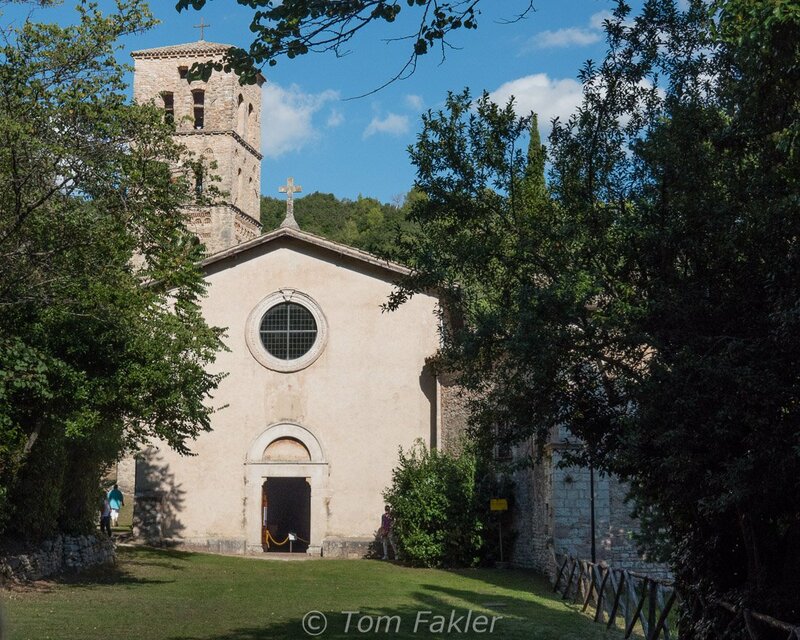 Instead, we received a blessing for our pilgrimage in the small church at San Pietro in Valle Abbey in Umbria, before stepping onto the path in Castel di Tora, in Lazio. The villages whose mayors, restaurateurs and hotel keepers turned out to welcome us included Rieti, Castel di Tora, Orvinio, Subiaco, Trevi nel Lazio, Collepardo, Casamari, Arpino and Rocccasecca. Stay tuned for more about the experiences and foods they shared with us! Simone Frignani, a lifelong walker and cyclist, is a biologist-turned teacher of theology. He loves the mountains and valleys of central Italy and he loves people. A scout in Italy, Simone discovered the “art of pilgrimage” in Spain and more recently experienced the freedom of the monastic life lived by the monks of Mt. Athos in Greece. Developing the Cammino di San Benedetto enabled him to combine a passion for nature with the beauty and sacred references of the life of Saint Benedict. He says it is the “essentiality” of the Cammino that he feels is its greatest message to walkers of all levels and ages. For two years, Simone worked on his own to clear existing paths, create them where none existed and seek out hospitality for guests in the villages and towns of the region. Then, with the help of local citizens who shared his vision–Simone calls them “people of providence”–paths were improved and signposted, showing the way through the holy valleys and hilltops of Lazio. The Cammino di San Benedetto now welcome upwards of 4,000 travelers each year, and efforts continue to develop tourism infrastructure here. Simone is also leading a project to restore hostel services for pilgrims in Norcia, devastated in the October earthquakes. People in this part of Lazio are not accustomed to the hordes of foreign tourists that flood Italy’s best-known places. 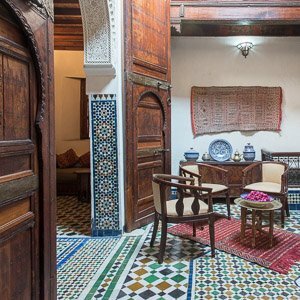 Hospitality here comes in the form of a ready welcome into tiny villages, and an eagerness to share the country fare of a mountain region. Visitors may well be drawn into a village festival, dance or village tour. The friendly welcome comes from the heart, albeit not always in English. In Guarcino, we met a 104-year-old resident who credits pure air and lots of steps for his robust health. Our band of journalists, bloggers and photographers represented at least six nationalities and an age range of about 40 years. Some of us were Roman Catholic, some not. Our group included several avid hikers, a couple of trail runners and sometime-walkers of varying levels of capability and endurance. After we reached Montecassino, our hosts reminded us that a big lesson of the Camminos is that we cannot walk life’s path alone. We need other people. That was certainly true for us, and we found friendship within the group and along the path. Each of the Italian Wonder Ways has a destination, but the destination for each pilgrim is a personal one. Since the earthquakes of October 2016, the route is disrupted from Norcia. 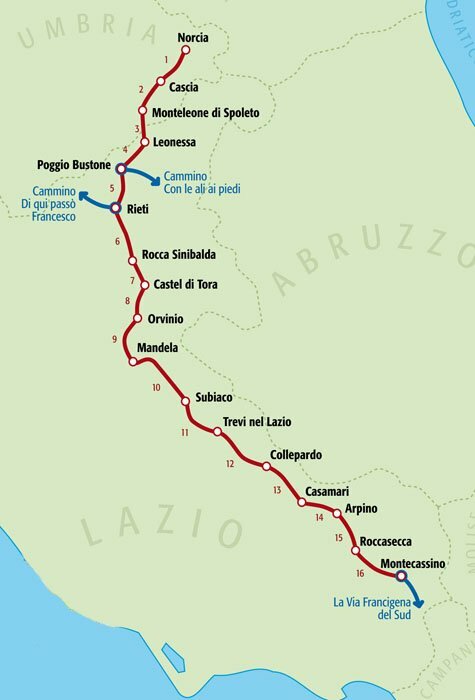 It is recommended to plan a walk from Leonessa southward. 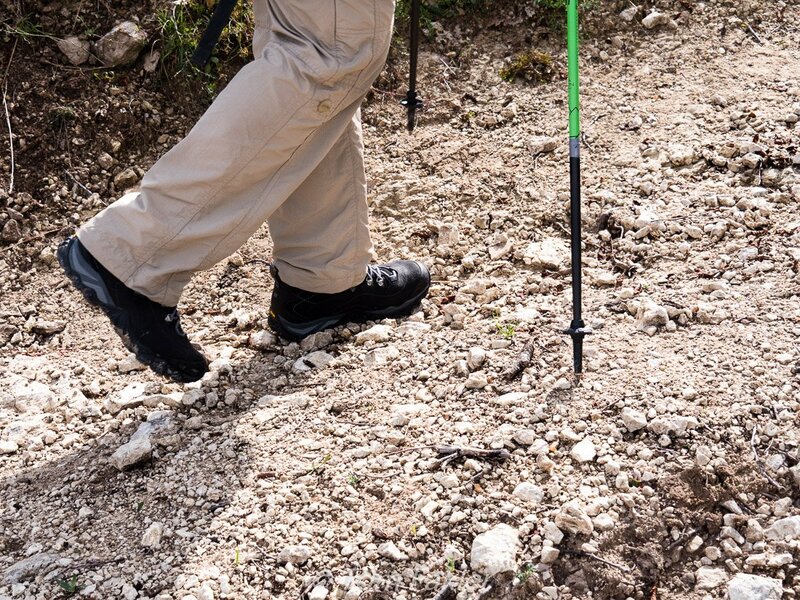 For updates on route conditions, reports of other pilgrims and progress reports on restoration of facilities at Norcia, check the Cammino di San Benedetto Facebook page. The Wonder Ways offer myriad ways to enjoy the central mountains and valleys of four Italian provinces, winding through Le Marche, Tuscany and Umbria, as well as Lazio. Various options are available for traveling the routes, self-guided, or with van services and a guide. We traveled with the Francesco’s Ways Consortium. Simone Frignani’s guide to the Cammino di Benedetto provides detailed maps and descriptions of natural wonders and villages along the way. Currently available in Italian and German, an English edition is in the works. Thanks to Visit Lazio for our great experience on the Cammino di San Benedetto, to Simone Frignani for your hard work and inspiration, and to Laura Dimattei of Francesco’s Ways for your cheerful support. We enjoyed your company throughout our trip, and were honored to be part of this first-ever celebration of Italian Wonder Ways! Wonderful article! Thanks for making aware of this Camino! Thanks Aysha, the Italian Camminos are wonderful! There was much you would have enjoyed along this way. HI Anita. Lovely inspiring post. Just wanted to alert you to the fact that yout site is not compatible with my iOad. Tge right hand site of your text is covered by your right hand sidebar. Hope you can fix this. Thx! Hi Doreen, sorry if you are having trouble seeing the full post. Our theme brings related articles out from the right side as you scroll down a post…on the iPad, this appears only to affect readability if the iPad is held in “portrait” position, ie if you read a post holding it “landscape” the text is not covered. We’ll see if we can improve this. Glad you enjoyed a bit of our pilgrimage with us! What a find! Would love to do a pilgrimage walk. I hadn’t considered Italy but it makes beautiful sense. 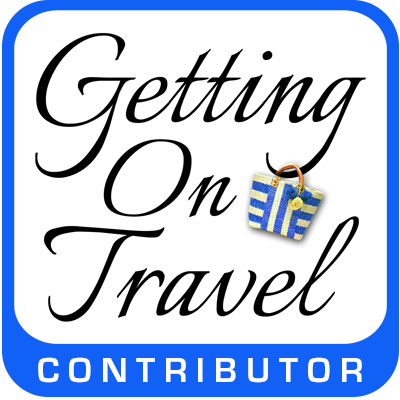 There are great pilgrimage walks all over Europe, Elaine, and the paths that run across Italy toward Rome offer myriad things to see and do along the way. I can only speak for Saint Benedict’s Way, and it is a beauty, for use. Sounds wonderful, Anita. Maybe I’ll have to branch out from the Camino de Santiago and start exploring other saints’ pathways! Does this count as training for the Portuguese Way??? Hah, Julie! It assuredly is training, and since we’re right smack on the Portuguese Way to Santiago, I guess that will happen at some point. There are actually five Francescosways in Italy, so you can take your pick of exploring any of four regions: Le Marche, Umbria, Tuscany and Lazio. 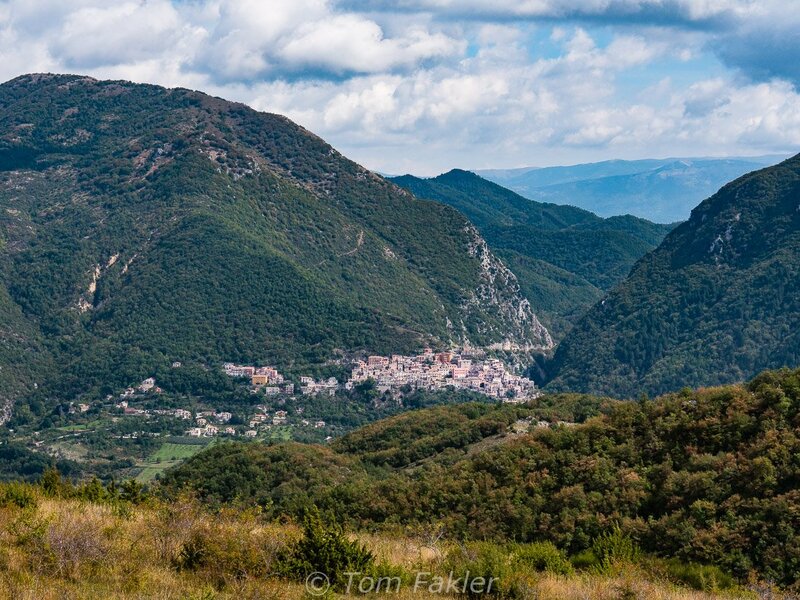 This Cammino sounds like a great way to see Lazio, such an underrated part of Italy. It is, Nathalie! Loved Lazio and happy to do what I can to help raise the profile of this lovely region. Thanks for your comment. What a wonderful experience and thanks for sharing it! Simone’s efforts sound like they may qualify him for a special type of Sainthood…literally clearing the path and paving the way for tourists sounds like an amazing feat. So glad you were able to participate! I really enjoyed reading this post. Thank you Irene. 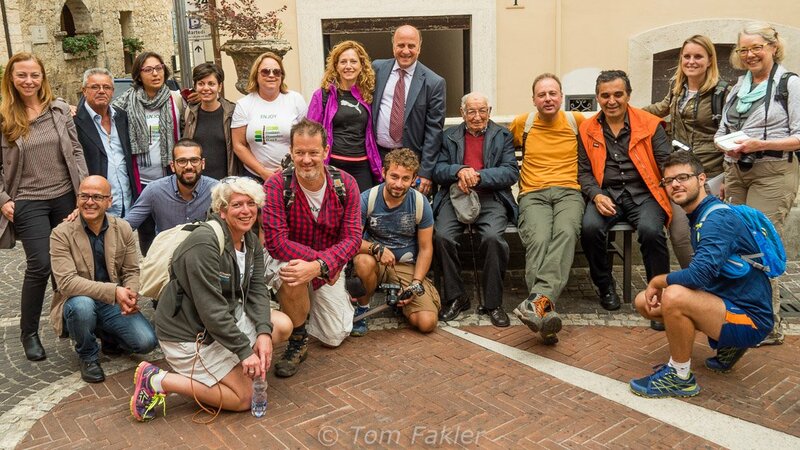 It was a indeed a privilege to join this walk along the Cammino di San Benedetto…and I think the participants would all agree that Simone is quite a local hero! 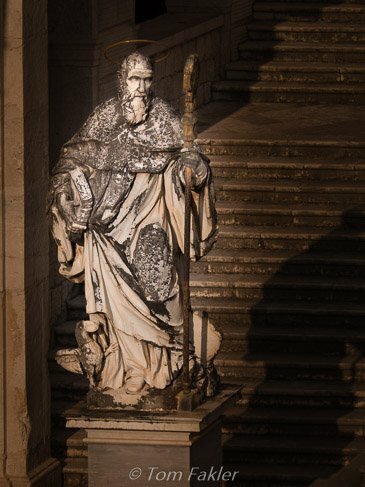 I found your article of interest, not because I am a fan of long hikes, but rather because of the story of Saint Benedict and even more so because of the mention of the Monte Cassino Abbey, which occupies a special place in the annals of World War II in Italy, and where a dear uncle of mine fought. Thanks for an interesting posting! Thank you Denis. There were many special moments along the way (not just the walking), and our end point at Montecassino was one of them. It is indeed a special place. There is a battle museum nearby, which we did not have time to visit. Stay tuned for more from Benedict’s Way! Anita, this is a great introduction to the Italian Wonder Ways and the Cammino di San Benedetto. This is right up our alley and Tom and I will be looking into following in your footsteps. Thanks Kristin. There is much more to the Cammino than we could see in such a short time…if you enjoy nature and history, you’ll have a great time. I’m not a hiker, so I especially appreciated reading about your experience and seeing your beautiful photos!! I could hike vicariously with you!! 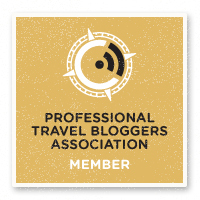 There is so much to see along the way…happy you could join us! This walk sounds very interesting. I have done the Coast to Coast in England , with friends, three years ago. I do not want an exhausting, steep walk of very long days. Is this walk steep or very mountainous? Also, is it possible to walk less than 20 km each day and have accommodation at night? Can the walk time be extended by a number of days? That way, we could walk fewer km each day. Thanks for your inquiry, Lyn. As part of the launch of Italian Wonder Ways, we walked just sections of the Cammino di San Benedetto, so I cannot really answer your questions with any authority. There is a detailed description of the walk in Il cammino di San Benedetto. 300 km da Norcia a Subiaco, fino a Montecassino by Simone Frignani. At the time of our walk, the guidebook was available in Italian and German, with an English version in the works. For now, perhaps you could contact the author for more information?